Learn how to use Facebook Insights to know when the majority of your supporters will see your Facebook posts. The internet is flooded with articles claiming to know the best times to post on Facebook. These recommendations by “certified experts” are based on broad averages and very general studies. In other words, they're guesses at best. This is not that kind of article. We want to help you get to the reality of your supporters’ Facebook habits. And guess what? You've had access to that info this entire time! Facebook actually tells you when your supporters are on Facebook, right there on your organization's page. So why would you go by general recommendations or averages, when you have your supporters' cold, hard facts at your fingertips...? Well, frankly, it's because so few page managers even know they have access to this data, let alone where to find it. But not you! After reading this, you'll know exactly where to find this helpful info and how to use it to the benefit your organization and your cause. 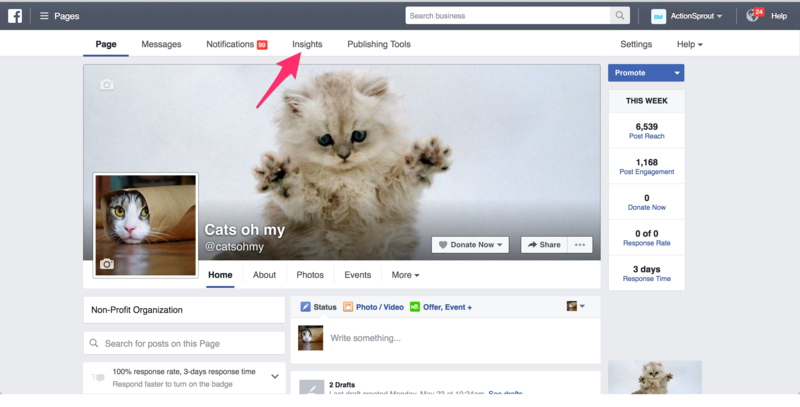 Log in and navigate to your nonprofit’s page on Facebook. At the top, you’ll see an Insights tab. Click on it. Then click on Posts in the left-hand menu. This will open up a graph. What you're looking at is a seven-day forecast of when your Page fans will most likely be on Facebook, given their past behavior. Why does past behavior matter? 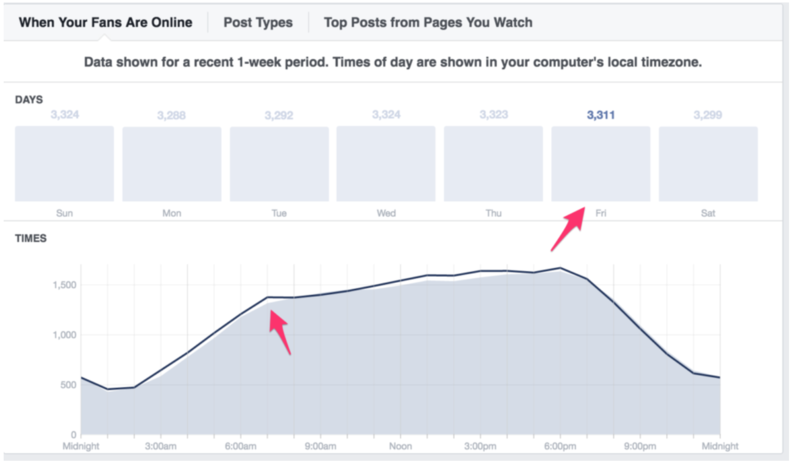 People typically login to Facebook at the same times every day, i.e. during their lunch break or after work. Facebook's massive amount of collective data shows that past behavior is one of the best indicators for future action. And with such a large sample size (i.e. their 1.3-billion accounts) to prove it, that's a pretty solid indicator to bank on. Just above the graph, you’ll see a series of bars—one for each day of the week. This tells you how many of your fans log in to Facebook each day, on average. In the above example, Saturday wins by just a hair. So if that Page had an important post or campaign coming up, they'd know the best day to make that announcement would be Saturdays. The graph then shows which hour(s) your fans will be on Facebook for that week as a whole. If you hover over a day bar (just above it) you'll see particular times for that day. In this example, if you hover over the Friday bar, you can see a unique spike at 7:00am. This would be one of the best times for this page to post on upcoming Fridays. We can also see that 1:00pm, 3:00pm, and 6:00pm have been uniquely good times to reach this page's supporters on Fridays. Here’s Thursday. On Thursdays in particular, it's showing that 8:00am, 9:00am, and 5:00pm have proven to be good times. While figuring all of this out can be a bit tedious at first, once you have a good sense of when your fans are online, it will pay you back in huge dividends. There's also an option, through ActionSprout, to automate this process. 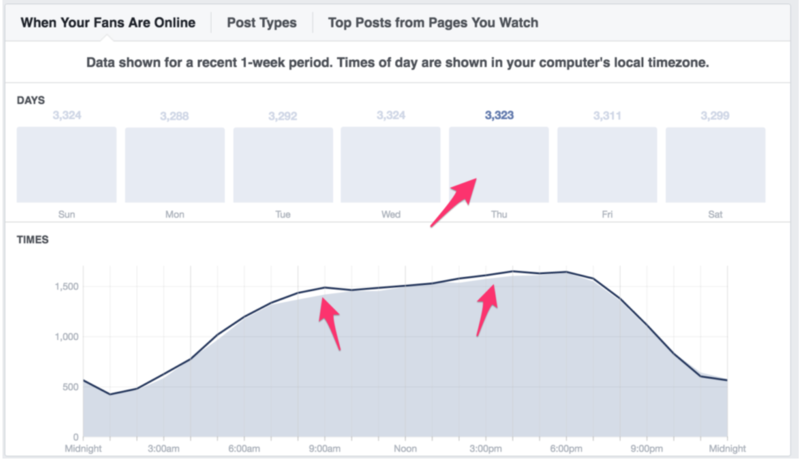 If you share any post from the ActionSprout app, we will show you the next best time to post on Facebook based on the graph we just walked through. You also have the option to browse these times for the coming week. 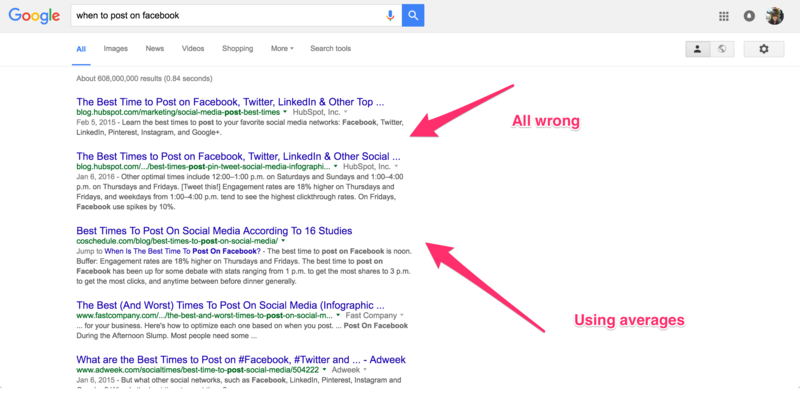 Simply click on the Optimal Posting Times link right below the default next best time. This allows you some flexibility, while still helping you make sure you’re always posting at optimal times. Some might call you a "certified expert" now. You know how to find out when you're supporters are most likely to see your posts and how to use that info to your advantage. So get out there and stop guessing. Start connecting. Want to learn even more about the data tucked away inside your page’s Insights tab? Here are the three top metrics you should know. Spoiler alert: Now you already know the first one. Have questions? Reach us at info@actionsprout.com We're always happy to help!